The sunrise revealed a thick fog bank stretching over the entire west coast of Vancouver Island. Our route plan, being determined by the weather conditions, had us leaving Tofino harbour bound for Cow Bay, a primary coastal feeding area for the Gray Whales. After travelling 10 nautical miles from Tofino by Zodiac in the fog I shut off the engine and asked everyone to listen carefully for signs of whales. "Woosh" – the sound of a blow, our first hint of the presence of a Gray Whale. Then the odour of the "Whale Breath" saturated us before we witnessed the grey-white back of the leviathan swimming towards us. We watched the whale surface again and dive into the kelp forest throwing it's fluke high into the air. The Bull Kelp forest of Cow Bay hosts the Gray's favorite food, 1000's of Mysits swarming around the sea floor. The whale entertained us for another 45 minutes, then we headed out for the offshore bird sanctuary and sea lion rockery. While on route we were surprised by a pod of transient Orcas. 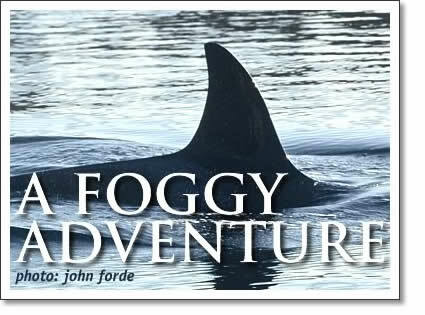 They are the most exciting and intelligent of the animals that we observe on the Pacific coast off Tofino. The pod played with us for a half hour or so before disappearing into the thick coastal fog. The fog lifted as we returned to the Tofino harbour revealing a beautiful day of sunshine, blue sky and the incredible rainforest of Meares Island. By the end of the tour we had seen everything. With the diversity of wildlife in Clayoquot Sound any given day has the potential to leave memories like this one. A foggy adventure: An encounter with a gray whale and a pod of orcas outside of Tofino, on the west coast of Vancouver Island.